Venture out of the city with trips to Ahvenisto Activity Park (in Haemeenlinna), Nuuksio National Park (in Espoo) and Valvilla Factory Museum (in Hyvinkaa). Pack the 21st (Sat) with family-friendly diversions at Linnanmaki Amusement Park. 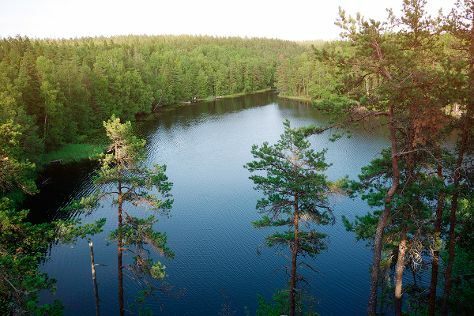 Spend the 24th (Tue) exploring nature at Teijo national park. There's still lots to do: brush up on your military savvy at Sea Fortress Suomenlinna, tour the pleasant surroundings at Korkeasaari Zoo, contemplate in the serene atmosphere at Uspenskin Cathedral (Uspenskin Katedraali), and pause for some serene contemplation at Rock Church. If you are flying in from Singapore, the closest major airport is Helsinki Vantaa Airport. In December, daytime highs in Helsinki are 3°C, while nighttime lows are -3°C. Cap off your sightseeing on the 27th (Fri) early enough to travel back home.